The well-known joke about Carnegie Hall might not be as old as the hall itself, but it comes close. That’s how the Grand Rapids Symphony Junior Youth Chorus got to Carnegie Hall, though cars, airplanes and busses also helped the group travel from River City to the Big Apple and back again. 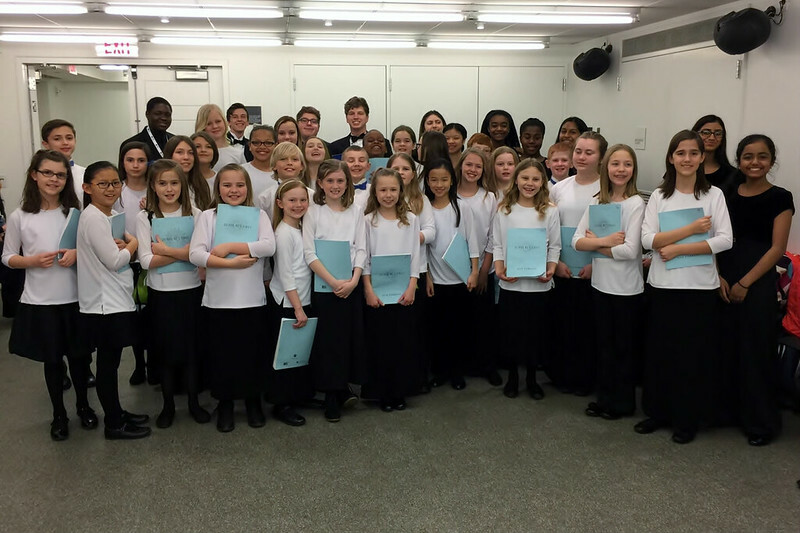 The GRS Junior Youth Chorus made its Carnegie Hall debut to sing a new work for chorus by composer Dan Forrest titled Jubilate Deo. The program presented by Manhattan Concert Productions was held March 21 in the world-famous hall at the corner of 7th Avenue and 57th Street in Midtown Manhattan. “It was such a thrill. The excitement definitely was in the air,” said Jackie Sonderfan Schoon, director of the Junior Youth Chorus. It was the first big trip in the history of the Junior Youth Chorus, founded nine years ago as part of the Grand Rapids Symphony Youth Choruses. A total of 36 of the 70 singers currently in Junior Youth Chorus sang in the hall that the Grand Rapids Symphony itself will return to in April 2018 with pianist Nelson Freire and Music Director Marcelo Lehninger. About 85 people, including parents, grandparents and others, spent four days on the road from March 18 to 22 with the concert on March 21. Some 800 singers in all participated in the program held in the 2,800 seat Isaac Stern Auditorium. “We were the only true children’s chorus,” Schoon said. The Junior Youth Chorus, made of young singers in fourth through sixth grade, age 10 to 12, participated in the performance of Forrest’s work celebrating unity and cultural diversity. Two of its seven movements were for treble voices only. Forrest was commissioned to compose the piece in honor of Henry Leck, founder and artistic director of the Indianapolis Children’s Choir for 30 years until he retired. Jubilate Deo was premiered in April 2016. Leck, a professor emeritus of choral music at Butler University, not only attended, he rehearsed and conducted its New York premiere. “He was absolutely masterful at drawing artistry and musicianship from the kids. He was engaging without being a drill sergeant,” she said with a laugh. “He spoke about the inspiration for the piece, the different angles he pulled from to make it fluid and coherent,” Schoon said. The text was set in several foreign languages including English, Spanish, Latin, Zulu and Chinese Mandarin. The English-language section sounded very American. The Chinese section featured an Erhu, a Chinese violin. “It was a very beautiful, melancholy timbre to it,” Schoon said. “It almost sounds like weeping or crying. Learning languages was an education in itself. Chinese uses tones, such as a rising pitch or a falling pitch to distinguish words pronounced identically. The Junior Youth Chorus has been rehearsing since December and will perform part of the work at its concert in May. “The whole chorus didn’t go to Carnegie, but they’ve all worked hard on it,” said Schoon, who directs children’s choirs for Westminster Presbyterian Church in Grand Rapids. The performance of Jubilate Deo was part of a larger program of music including John Rutter’s Requiem, which was directed by Anton Armstrong, conductor of the St. Olaf Choir. In the 1980s, Armstrong was director of the Grand Rapids Symphony Chorus as well as a professor of music at Calvin College, which Schoon attended. “He was a very poignant part of my musical development, and he showed me, not only the music that can be made in the choir, but also the community that can be built in an ensemble such as that,” Schoon said. The Junior Youth Chorus did more than rehearse and sing during its four-day trip. Chorus members, chaperones and family visited such sites as the Statue of Liberty and Empire State Building, rode the Staten Island Ferry, and visited the “Top of the Rock” at Rockefeller Plaza. But the group did work hard and performed well, Schoon said.